The new, seventh-generation Honda Accord stands out with its dynamic design and sophisticated chassis. 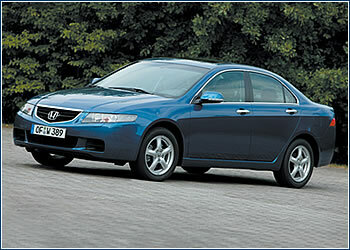 Now it comes with a powerful, economical 2.2-l turbodiesel, the first engine of this type to be developed by Honda. THE FOUR-CYLINDER aluminum power plant with the complicated designation of 2.2i-CDTi and second-generation Common Rail direct injection turns out 140 hp (103 kW) and maximum torque of 340 Nm at 2,000 rpm. It is distinguished by its quiet, smooth operation, as well as by the lowest fuel consumption in its class, which is aided by a new, five-speed transmission. 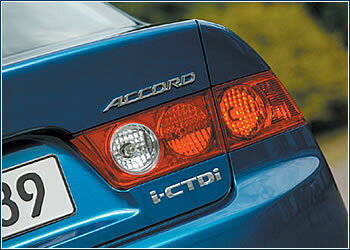 Furthermore, the Honda turbodiesel easily meets the Euro IV ecological standard, which is due to go into effect in 2005. Driven by this motor, the 4.66 meter-long Accord with its extended body reaches a top speed of 210 km/h and accelerates from 0 to 100 km/h in 9.4 seconds while burning only 5.4 liters of diesel fuel per 100 km. The spacious, 4.75 meter-long Accord Tourer station wagon fitted with the turbodiesel also flirts with 200 km/h, consuming 5.8 liters of fuel on average. Thanks to its 65-liter fuel tank, the station wagon, like the sedan, can cover over 1,000 kilometers on a single tank, provided you drive reasonably. The Sport model of the Honda Accord sedan with the turbodiesel will sell on the Czech market for CZK 789,000, and the Executive model for CZK 899,000. The Accord Tourer station wagon with the same engine will cost CZK 829,000 (Sport) and CZK 949,000 (Executive). Besides its models with the turbodiesel, Accords come with gasoline engines, like the Comfort sedan, with its four-cylinder, 2.0-l, 155 hp (114 kW) motor selling for CZK 749,000.